By applecupcake on August 16th, 2010 . Filed under: Tattoos . 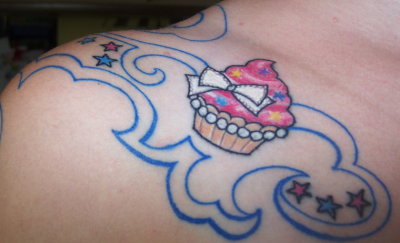 This cupcake tattoo is literally still hot only being done a week or so ago! But what makes it so cool is the unique idea that Margo had. 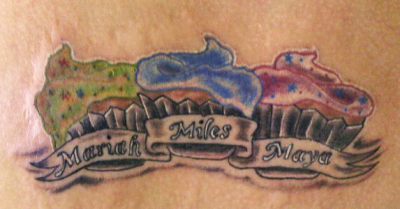 You see Margo has three gorgeous kids, so she asked them to each select a frosting and then had each one tattooed on her back. The picture to the right here is Margo showing off her new tattoo less than an hour or so after it was done! Our second idea was found and greatly admired by one of our readers. It is a cool swirl of blue in the middle of which sits a very prim and pretty cupcake adorned with bow and pearls! Thanks Margo and Angie for sharing.